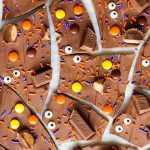 Halloween candy bark is a fun treat that takes minutes to make. 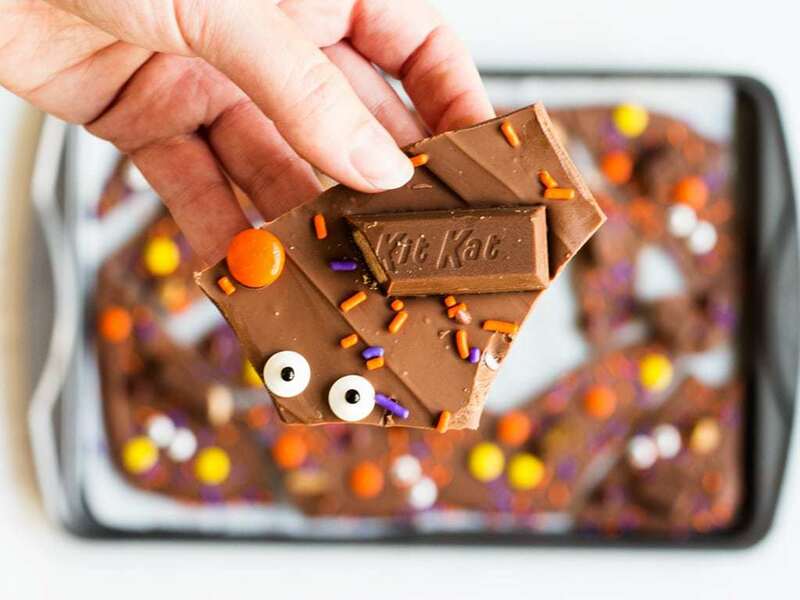 Sprinkle leftover Halloween candy over melted chocolate, chill and serve! In a few short weeks Halloween will be upon us and there will be an abundance of candy. I’m getting a jumpstart on the sugar high and made Halloween candy bark for the holiday! Bark is the perfect use for leftover Halloween candy. Simply melt chocolate and sprinkle whatever candy you please on top! Any candy will do for this bark, but I chose some of the classics, like Kit Kats. I’m also a big fan of chocolate and peanut butter candies so I used Reese’s peanut butter cups and Reese’s Pieces on my bark. The pieces added a nice touch of fall color without me even trying! I still wanted a little extra flair, so I added purple and orange sprinkles. They make the bark extra fun! 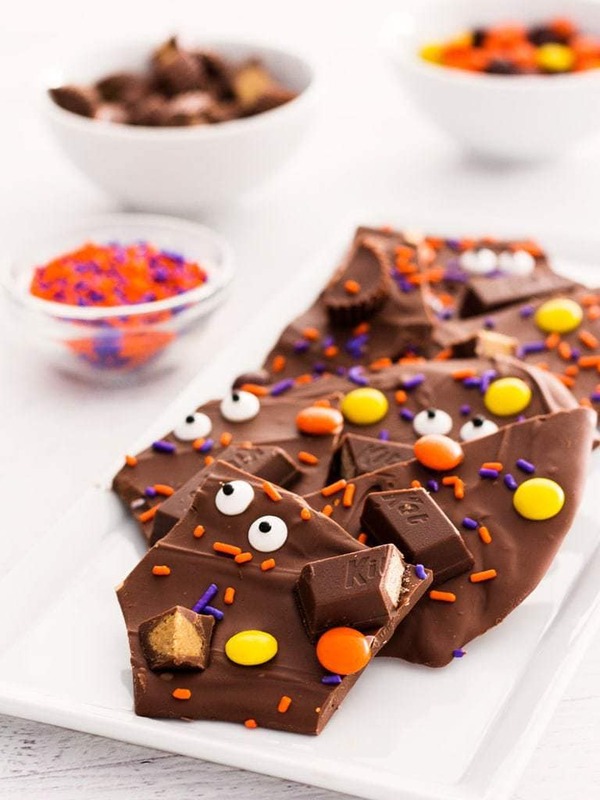 Eyes on the Halloween candy bark adds a spooky touch. It’s like little monsters peeking out from a mountain of chocolate candy! Kids would love this Halloween candy bark too (especially since it’s a no-bake recipe). They can get creative with all the candy they collected while trick or treating! 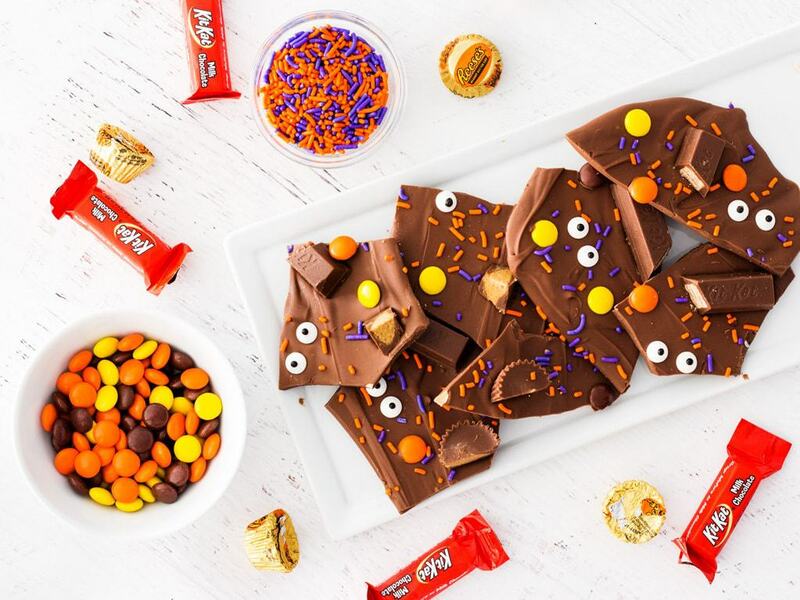 Twix, Snickers, M&M’s, candy corn—so many candy options for this bark. Once the bark is made, store it in the fridge or freezer. The cold texture is satisfying to bite into and the candies add an extra crunch. Halloween bark is a fun treat to make with kids or if you’re having a scary movie marathon! Check out the recipe video below to see just how easy it is to make. In a microwave safe bowl, melt the chocolate for 1 minute on 50% power level. Stir and continue microwaving in 30 second intervals until completely melted. Pour melted chocolate on to prepared baking sheet. Spread with a spatula until about 1/4-inch thick. Top with Halloween candies and sprinkles. Chill in fridge for about 45 minutes, or until the chocolate is hard and candy is set. Break or cut bark into irregular shapes. Serve immediately. Store leftovers in an air-tight container. Inspired by Just a Taste and Cooking with Janica. The eyes are the best part if you ask me! this is incredibly adorable!! I love it when something so simple can be so genius!! This looks so fun! I love how colorful it is. You can also never go wrong with Kit-Kats. They are my favorite candy bar! Thanks, Daniela! I love Kit Kats too! Somebody is so ready for the Halloween. OMG! Time flies so fast, yes? This looks absolutely pretty. I am sure it tastes amazing!! 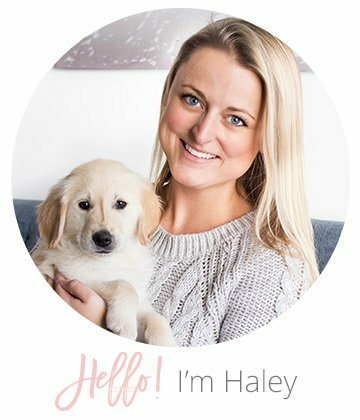 Thanks for bringing at Fiesta Friday party, Hayley! Did I see a video on FB on this from you? I feel like I have! My son would love these. I’d definitely would make these for him right before dropping him off to grandma’s! Super cute. I love this, I might have to make this for Halloween. This is so cute. I bet my niece and nephew would have so much fun making this at Halloween. It is so cute and my kids loved it. it is tasty and delicious. amazing.